It has come to that time in the year where I round up all of my favourite beauty products from the year and try to narrow it down to my absolute favourites. Part one was my favourite foundations and concealers which you can read here if you missed it. Today is part 2: blushers, bronzers and highlighters. Now I chose this palette because even though it is expensive, it is worth all the hype. Hourglass blushers for me have to be my absolute favourites. I really like the texture and finely milled baked bronzers. In this palette my favourite blush is Mood exposure. I also really like Incadescent electra from the Hourglass ambient lighting blush palette. If you are on a budget I would also recommend the Maxfactor creme puff blushers. I did a comparison/ dupe post here comparing the two. I had to include both versions of this contour as I love them both! It's the perfect contour as it is not too orange and looks great to define those cheek bones. It's a shame the cream version only comes in a duo and is tiny!! I hope they release it is a bigger solo version. I'm still out on the hunt for the perfect cream contour- do you have any suggestions? 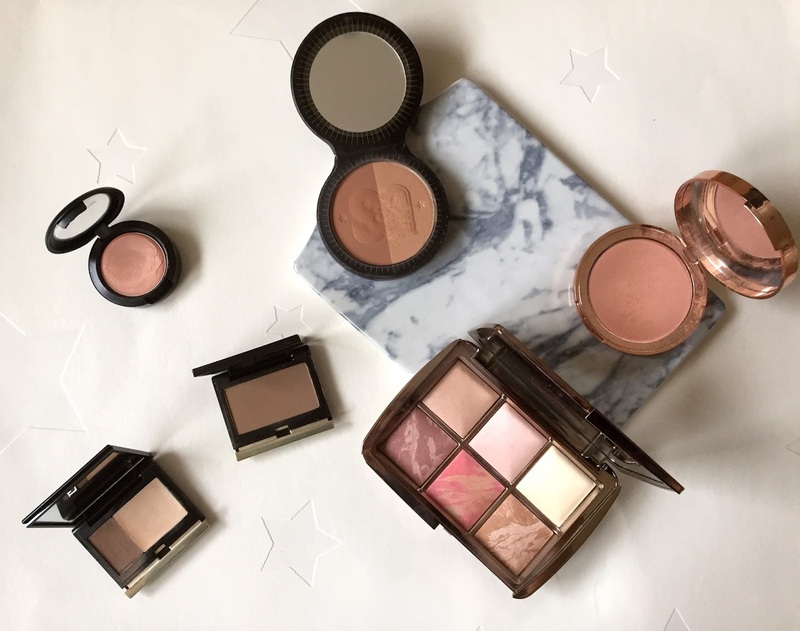 For my favourite 2015 bronzer it has to be the solar powder bronzer. I really like how this is split into 2 giving you the option to lighten or darken compared to how tanned you are. It is a great drugstore product and isn't too orange or shimmery. I really want to work my way through this quicker as they have brought out the product in a better plastic packaging this year- well done soap and glory! I first saw this in a Pixiwoo video that Nic did and I knew I had to get it. I LOVE cream products as personally they look much better on my dry skin. This is the perfect highlighter for any occasion- day or night. It gives a lovely glow with a golden/ pearl glow without any shimmer/ glitter. You should definitely check this one out. Now I was really tempted to put in the blogger cult Champagne pop highlighter by Becca/Jacyln Hill but it wasn't making an appearance on my face daily as it can be quite OTT. This highlighter however is perfect. It reminds my of the Balm Maryloumaniser. This was a limited edition collaboration that Charlotte did earlier in the year but is still available here. The packaging is gorgeous and this is again a lovely golden pearl highlighter but this time is a lovely soft powder form. I hope you found this helpful. What are you favourites for this category?